The LC1 is also called the sling chair. This model is made of European leather and produced abroad. Often discussed as a "sitting machine" and one of the signature classics of modern design, the Le Corbusier Basculant Armchair (1929) was an integral part Le Corbusier�s full burgeoning of the International Style. Introduced at the Salon d�Automne, the Le Corbusier Basculant Armchair's emphasis lay in the juxtaposition of new construction techniques, mechanical versatility and precious materials. 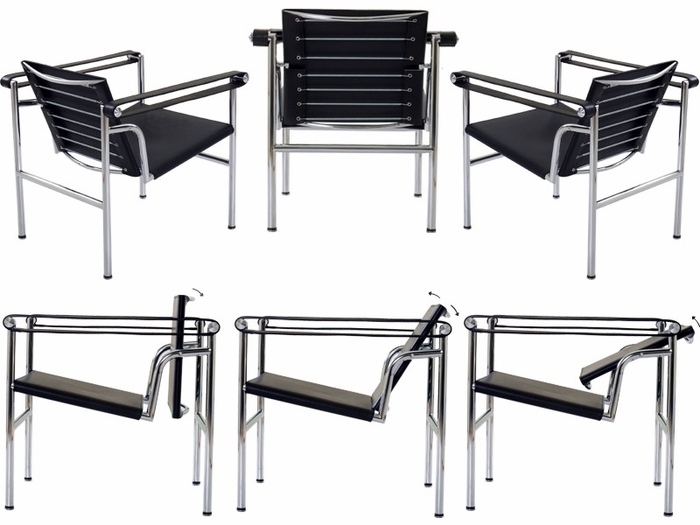 The beauty and grace of the chromed-steel frame lies in eight simple tubular pieces that are seamlessly welded together and given life by two unexpected arcs connecting the seat to the posterior frame. The visual effect is that of simultaneous weightlessness and solidity. The overall comfort of the chair is exceptional, with a reclining seat and mobile back for constant support. A natural black leather seat and back with black leather sling arms lend warmth and stylish neutrality to an artfully constructed design of classic luxury. The 100% Italian leather is made in Italy. 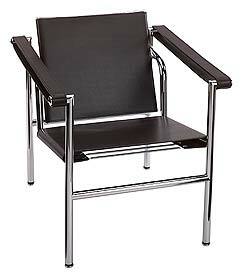 Material Chromed-steel tubular frame, natural black leather seat and back with black leather sling armrests. Measurements H 25.5" W 23.5" D 27" Seat Height 15.5"
Gibraltar Furniture has the largest selection of Le Corbusier furniture in stock and ready to ship today!